So. Uh. Lovaas said this, in his 1981 book, The ME book. This is where Lovaas first spelled out ABA. So. There you have it. Y’all are demanding insurance pay for ‘therapy’ invented by a man who literally thinks we are not people until we perform to his specifications. This is a Facebook status my friend Kassiane Alexandra S. posted, reminding us of the origins of Applied Behavior Analysis, or ABA. Remember that Lovaas not only decided that Autistics were subhuman, he also tried abusive experiments on “a feminine young boy”, even though this boy stated, as an adult, that the “treatment” did not work. Can you imagine people saying, today, that homosexuals should be abused until they became heterosexual, and such practices being openly advertised, mainstreamed, praised and covered by insurance? Some people seem to think that when independent thinking Autistics – the ones who escaped the abuses of ABA, or the ones who can see behind the curtain of deceit – talk about how harmful this “treatment” is, that we are simply trying to make noise. We speak up because we know that our identity and our humanity cannot be taken away, something people who don’t share our neurology seem to believe can happen. And they do try. They decided to follow the teachings of someone who said that we only have basic rights if we comply with the neuromajority. Sadly, too many Autistics are not allowed to reclaim their rights. They are not allowed to say “no” to forced compliance. They are the ones “excelling” in ABA. Another point I want to make is about the financial cost of ABA. Sessions are expensive, and the so-called experts declare that an Autistic child must start ABA as soon as a diagnosis is given. My ABA is not like that. Autistic children need to learn certain skills. Your story really touched me. I’m so sorry you were made to feel bad about yourself. You are a beautiful human being and deserve to be treated with dignity. It’s my understanding that Lovaas was advocating for equality regardless of IQ or developmental delay. The principles of behavior are always at work whether there is a formal program or not. It’s the science of how we all learn. I am baffled as to how anyone could flunk ABA therapy. If a strategy isn’t working, modifications to the program should have been implemented. DOUGHNUTS AND TAKE A NAP”? It was published in 1990 in the Journal of Applied Behavior Analysis. “The principles of behavior are always at work whether there is a formal program or not. It’s the science of how we all learn. Good ABA involves NATURAL ENVIRONMENT TEACHING and INCIDENTAL LEARNING (a lot like Greenspan’s DIR). The statement, “Autistic child must follow to exhaustion, responses an Autistic child must give “correctly”, even if the answers don’t match the child’s feelings or preferences,” IS NOT TRUE OF GOOD ABA and when you are teaching vocabulary or any other facts, you can’t just accept a child’s feelings or preference for what a correct answer is. A ball is a ball, it’s not a book. If child points to the wrong object, they are wrong. Good ABA does not push the child to exhaustion, it does give preferences when appropriate. All students are forced to learn certain things in school. I sure wasn’t happy about having to work in school. For example, I was working on a joint attention play skill (car play) with a 2 year old. He suddenly became very upset and resistant even though he had loved cars. I tried again on different days, but.he was still distressed. So I changed it. Instead of using the toy for joint attention play skills, I used it to teach communicating yes and no. He was prompted to say “No” when offered the car and it was put away. Being able to communicate (including the use of yes and no instead of just screaming and physically lashing out) is a need and teaching that is not abusive. I never expected a child to act neurotypical. I expected them to be able to function in the world they must live in. Sure there are some things that they MUST do, for example, one child needed to be taught not to walk out of the bathroom with his pants around his ankles. As an older child or adult, he could end up in jail doing that. It is not abuse to force him to conform to acceptable behavior. I ALWAYS INCLUDED TIME for the child to initiate and lead the activity. I allowed the child to have his own thoughts. By giving the child (or adult) time to initiate, a good therapist can get insight into the student and can help that student use his or her natural skills.. There is not Good ABA and bad ABA. ABA is always ABA, it is always trying to modify who we are to fit the idea of a normal, based on who neurotypicals are. And the world he will live in is only accommodating to people who “behave” in a way that is impossible for us. Why not show the world that we all can fit in, with accommodations” If a child needs to fake, than it is not success. And it is a fake, even when neurotypicals are “happy” with the outcome. Each person has a personal time and pace, Respect that. And ABA also praises the child who likes ABA. The child who says “I don’t like it” gets more prompts until they say “I like it. So it is also manipulation. Did you not read anything she just said? I don’t know about you, but attacking other people and yourself is NOT an acceptable behavior in ANY society on planet earth, and that’s part of what ABA addresses. Problem behaviors that are a harm to the person and other people. Problem behaviors that affect the quality of life of the individual. I have a nonverbal client right now who gets very very frustrated because he can’t communicate his needs like when he’s in pain. Instead of communicating it through words, he goes straight to attacking people. I’m sorry, but that’s completely unacceptable. Teaching someone to not attack someone when they need something is NOT abuse. So, you’re telling the person who’s experienced ABA, how it really is? Do you have any idea how awful that even looks? When you tell a person that their experiences didn’t happen, that’s Abuse, That’s Gaslighting. And your nonverbal client, whom I feel very sorry for. Rather than ‘teaching’ him not to attack, Why not try to find out why he’s behaving that way? Would that take too much work? Have you no letter board? Or picture board? Or Ipad with words in it? Non verbal does not mean unintelligent. If you give a person TOOLS to communicate, you find out what the problem is. Obvioulsy she gets her money from that aba trade so can’t even consider the other side of the story, I recommend that you do more more reading on sensory needs, apraxia, anxiety, impulsiveness, body-mind disconnect…. I pity the autistic you are working with. Whoa, please tell me you found out why that child suddenly became distressed by cars? Why is a child doing something means playing detective, interviewing those close to the child because you have no idea otherwise what kind of distress you are placing on the kid withou first understanding the cause behind the sudden distress. Kudos to you JMITW for your comment, I couldn’t agree more. Amy, I am appalled at your article. You are entitled to your own thoughts, but you are not entitled to falsely accuse someone of abuse, and that’s exactly what you are doing. You are accusing me of “abusing” my grandson because I enrolled him in ABA, you are accusing all the wonderful Therapist that work at our ABA Center of Abuse. . For a moment I thought to myself, are we actually talking about the same ABA? The world in which we live should be the one that is on your chopping block, not ABA. My grandson exhibits intense aggressive tantrums which grow in intensity. He does not do well in public places, spits on strangers to relieve his aggression and anxiety. The children at the daycare shun him, won’t include him in their playing, don’t socialize with him and want nothing to do with him.. What kind of childhood is that for my grandson? He deserves the chance to learn social skills, coping skills and daily living skills. Despite all my hard work and efforts, he needs more then just me to try to teach him these things….Our jobs as parents are to teach our children RIGHT from WRONG and prepare them for the cruel world ahead of them as adults. I want my grandson to have the happy and memorable childhood that he deserves. Do you really think that a child that has multiple aggressive meltdowns/tantrums a day due to his lack of communication skills, has no friends at daycare due to lack of social skills is living a happy and memorable childhood? Let me answer that for you, NO. ABA is providing my grandson with the skills he needs to better communicate his needs…..I can’t distinguish his needs thru aggressive meltdowns, but I can distinguish his needs thru the communication skills he is learning at ABA. I can’t make friends for him, but he is starting to make friends on his own using the social skills he is learning from ABA. No one at ABA is trying to change him or conform him to “their ways”, they are simply teaching him things that typical kids already know thru a natural fun and , That certainly is in no way shape or form abuse. I can take my grandson to the park or local indoor playground and he has fun now, because he can interact with other kids and have a good time while being included. As far as the number of hours a day/week he goes to ABA, well the hours are same hours he will be in school, but no one finds the length of a school day abusive. My grandson is a better version of HIMSELF thanks to ABA. Comment has been deleted due to violation of AWN’s commenting guidelines. Mary, your comment has been deleted due to violation of AWN’s commenting guidelines. You are patronizing and mocking Amy by saying she doesn’t know what she’s talking about. You directed your comment to another person while knowing full well Amy would see it. Your commenting style is that of a bully and not allowed on our website. Hi AJ, you will probably never see this but part of me hopes you do. I am an autistic person, and I also worked in ABA. Now, when I was a child I recall going through lots of tests with counselors and therapists and them telling my parents that they believed I was Autistic. That I needed to go to a school to better accommodate me and go to a doctor to get a full diagnosis. Due to my parents not wanting to acknowledge their child as “different” and the lack of insurance we had back then, I never did. I only knew that “something” was “wrong” and struggled the rest of my life until, in adulthood, I managed to get insured and was diagnosed fully. Before this, I hadn’t known anything about autism, I’d only ever heard of it without an explanation to it. I understand where you’re coming from. Your grandson has things he needs help with and ABA is addressing them in a way that helps your family. However, as a person who has worked with SEVERAL different ABA companies before really understanding what they did to autistic people, I want you to know that they do NOT have his best interest at heart. I remember having a student who would do all his work but liked to stim with his hands in front of his face. Despite the fact that it did not impair his work and comforted him, we had to implement intense behavior interventions to stop his “problem behaviors”. Behaviors that did not disrupt anyone and did not impair his work. However, it wasn’t “age appropriate”. And that’s the issue. It’s not about whats best for the autistic person, it’s about what’s best for those around them. I knew a student who, when engaged in self injurious or aggressive behaviors, had to be held down. That was the intervention. To hold him down. Or to wrap his arms around his body until he stopped struggling. How does that sound? Does that sound good? Let me explain the deciding factor that lead to my immediate quitting. I had to go to a company wide training with one of the directors who founded our company. I arrived late, which they already knew I would because I had to drive from far away, and ended up sitting in the back. There was a slideshow and the man at the front was discussing the history of ABA. He goes into detail about the electric shocks, about the brutality of the old ABA, all with a smile. “It was barbaric, but at least it was effective.” He’d said after just mentioning how they electrified the floor beneath an autistic person to force them to interact with their parents. That continued for the next hour. Talking about how sad autistic people are, how our goal is to make them “normal” since they had “low IQs and couldn’t do anything.” I had to sit there while they laughed about autistic people and how much they’ll never amount to anything unless they get “cured.” As if I wasn’t in the room. Did that director know I was autistic? Probably not, I doubt he cared to check anything about us before coming to that training. And, even if he had, I doubt it would’ve changed anything. He may have even doubled the efforts or, worse, used me as “proof” that autistic people can be “worth something”. Kids learning social skills? That’s great. Kids learning to communicate? Awesome! Kids learning that everything about them is flawed unless they can hide themselves enough to be deemed “worthwhile”? Not awesome. THAT is what ABA wants. Maybe the place you have your grandson in doesn’t do those things with your grandson. But think about other children in their care. Do you think they think the same of them? I was “lucky” to be deemed “worthwhile” because I can mask my autism because most of my difficulties are educationally based and slightly social. I learned but at the cost of myself. I have difficulties holding down a job and only recently started being able to understand that me stimming or needing help doesn’t mean I’m worthless. I know you love your grandson and it’s hard to hear that something would be hurting him. Maybe in your eyes it isn’t. But the thought is always “Is it in their best interest or MY best interest?” and if it’s in YOURS, then something needs to be changed. I think it depends on what Lovaas saw as ‘equality’. Amy didn’t fail. Amy did well – for herself. … on ya’ Amy!! I’ve seen, with my own eyes, and in a government (Australia) setting, behaviour by early interventionists that, it now seems to me (I’m talking February 2016) was reflective of certain ABA methods, and which I found alarming and astonishing – given that these people were supposed to be the carers of (howevermuch also the teachers of) small, vulnerable children. Not happy. Work to do. All the best Amy. Thanks for putting this on the internet. ABA is a outdated way to Bill insurance. Parents are told not shown the degradation it causes to the autistic children. I got diagnosed as a grown man,but my whole life I never fit in with any groups & now with most of my family dead I’m pretty lonely, but I’ll figure it out. I have Asperger’s & a very high IQ that helps me to figure out things that aren’t too social or emotional process. I’m a female on the spectrum. My IQ is high and I’m high functioning. I have no family (literally). Both my parents have passed away and my sisters don’t speak to me because they don’t believe in mental disability. I’ve been learning to live alone and do things myself. I agree wholeheartedly on all of your comments on ABA, however I feel you’re trivialising the treatment of homosexuals around the world. Look at the mainstream abuses and treatment of homosexuals in countries other than the USA to see the conversion therapies, violence, therapies and even killings that happen. The only difference between ABA and conversion therapy is the imsurance angle unfortunately…although I would bet there is a way around that in some parts of the USA?! I was simply pointing out that the outcry comes from everywhere when those “treatments” are exposed. I do know anything that is not heteronormative is a reason for prejudice and even hate. This does not happen with ABA, as you can see by some comments that fit exactly what I wrote in the article, same excuses. Only most people actually condemn those things when they happen to gay people. They make excuses for them when they happen to autistic people. First off gay people or gays is the preferred term and secondly there is still abusive therapy to “correct homosexuality” in the U.S. California just recently banned reparative therapy of this kind and insurances still cover it elsewhere. Parents need only send their teenagers to an out of state “boot camp” or a pastor for “counseling” to get around the law. Oops that posted before I could say: Now that I’m off my soap box, thank you Amy for being a voice and advocate for your community! So fabulous! Amy, may I share this? I’m too shattered to respond at the moment. ABA feels like torture to me. Thank you so much for your beautiful article. As the partner of a well-respected ABA professional, I can say with certainty that she does not approach her day intending to abuse. She most often describes the surprises and the unique perspectives expressed by the people she works with (clients). I never know their full story, but as a professional my partner’s focus on the personhood of her clients seems to be what lasts from day to day and what governs what kind of “programming” they’ll focus on together next time (personalized treatment building on their unique personal development). She seems to receive a great deal of love and celebration by her clients, past a future. Parents like her too, but it’s the love by clients year after year that really impresses me and encourages me to feel good about her execution of ABA if not ABA in general. Obviously, this is not everyone’s experience as a client, but it is *some* people’s good experiences of being an ABA client, and that matters. I wish and hope ABA professionals were more like her and less like those that Amy (and the other’s she mentions) worked with. Amy, perhaps you’ll write another article about human dignity and how you kept it or reclaimed it in your process. Clearly learning to say no and to value your own neuro-unique-ness had a lot to do with it. What else should someone on the spectrum do or remember to find and keep that dignity? I suspect that neurotypicals may also benefit, both in their understanding of their on-the-spectrum friends and of themselves. The point that really strikes me is the loss of individuality due to the amount of time and effort spent on ABA. As a disabled person with little energy and concentration I understand these limitations keenly. Even if you were spending 40hrs/wk of learning Spanish *to exhaustion*, you would have little time or energy to put towards any other kind of development. You might be hard-pressed to even complete the rest of your daily routines “effectively”. Ignoring the ABA content, the act of wearing somebody out in pursuit of a goal they don’t value for 40hrs/wk would both exhaust and despirit anyone, and more so those of us who struggle just to “function” in a typical way. This might qualify as abuse simply because it prevents personal development by preventing the client from having energy for other efforts (specifically, to feel human by pursuing their own pursuits and growth for at least part of their days). I’m very glad for your successes, Amy, and I hope you’ll go on writing and educating us all, ASD and not. Thanks! Whether your partner intends to be abusive or not is irrelevant. If I have a meltdown and hurt someone, “I didn’t mean to” isn’t an adequate response, and it does not excuse me from responsibility. Amy didn’t “reclaim” human dignity because humans automatically have dignity. Amy has always had dignity. What’s varied is whether people, like ABA professionals have acknowledged it or not. Applied behavior analysis was something rather traumatic that a lot of people on here have been forced to experience. I know full well about what goes on, and the kind of oppression it gives. It’s even worse when this is a part of how SpED teachers function in the mainstream education system. No matter how much sugar-coating or political correctness goes on (seriously, “learning disabled”? ), the beliefs, origins, and formula are the same: force mainstream neurotypical conformity down the throat of an innocent civilian until they comply. It’s absolutely no different from the treatments that existed for homosexuals to not be gay; we fully recognize nowadays that those kinds of treatments are unorthodox and completely unethical. Yet this same abuse is allowed for autistic people. It reminds me of a thought I had today: how many people has autism killed? How many genocides, wars, revolutions, has autism committed? How many human tragedies were as a result of autism? what’s with the past tense? gay conversion therapy is still used (alarmingly widely, even). You are right but to my knowledge it is not mainstream and it does get a fair amount of criticism. ABA is praised and pushed everywhere, and insurance companies are, in some states, forced to pay for it. Maybe I am wrong, but I don’t think insurers are forced to pay for gay conversion therapies. If they do, it is equally outrageous. I just started ABA myself as an adult. I love it. I wish my parents HAD put me in it as a child. My hope is that I can still become 100% neurotypical through repetition and neuroplasticity. I know there are a lot of naysayers, saying that’s impossible. But we know that brains can change throughout life, so trying to make ASD into some sacred, mystical, “difference” is wrongheaded. It certainly would be easier, to rewire the brain of a child. But I refuse to give up until I’m 100% neurotypical. My son is autistic and daughter may also be. The evolution of my understanding has been quite a journey, over the last couple of years in particular, as we kicked ABA out of our home and embraced the autistic community. I was never comfortable with the concept of ABA, but approached it from the mindset of doing early intervention to help build on strengths & developing coping skills for the challenges. So yeah, not a good fit & when we started seeing negative effects, we said enough. can I ask what helped? I have a son diagnosed high functioning and I also think my daughter might be on the spectrum as well. This is disgusting. I wonder how parents allow other people so much control over their kids even when it’s clear that the kids themselves are not okay with what’s being done to them. It’s to do with respecting people as people, even if they are kids, teenagers, adults, homosexuals, and yes- autistic. It doesn’t make them any less human. Not sure if your remark is directed towards my comment or the post. For us, we did NOT allow others control over our son during his therapy. It was a major bone of contention and ultimately part of why we quit. In our experience, we were actually discouraged from being active participants, which didn’t fly at all. We also tend to question things, including doctors. I know many people of the mindset that the professionals know best & should be in charge. I’m really glad that we don’t fit that “mold”. I want to elaborate on my previous post. I feel that I didn’t say enough about my experience with applied behavior analysis, and how I feel about it in hindsight. If I may say this first, I have Asperger syndrome but I don’t consider myself disabled. I can live fine without any assistants. My speech is perfectly fine. As for socializing, I prefer online anyway. I’m not going to rant further, so let’s cut to the cheese. Before 2005 you could say I was just like any other child. I had fun in school, jumped and ran around, and I genuinely enjoyed being a kid. But then around 2005, it wasn’t the same. I remember in 2005, I was just plain disengaged with a lot of school homework and instead I just browsed on the computer. Apparently I was a difficult child to teach. Let’s fast forward to 2008. This is where the brown hit the fan. Middle school. I hated middle school. I was entering a new school district. I got bullied every day by almost everyone in the school, so it was practically me against the world from 2008-2010. I was overweight, I was inconfident with myself, and I was completely alienated. I remember during middle school, in each and every class I was given an assistant. In all honesty I found them to be very bothersome, because it seemed they were there to “correct”, rather than actually help me. This really only painted me as a target in the eyes of the NT bullies. Not only did they have no respect for my own self-development, but they had no respect for privacy of my neurology. I was put in speech classes, which were quite rudimentary and frankly, more fit for kindergarten children. The implications were horrible and they were right there; they believed that I wasn’t a full-functioning human being, and therefore had to be pandered to in any way. This would actually halt my development, because I didn’t believe that I could be better. I think this is the absolute one thing that really got on the teachers: socializing. The teachers had such a huge emphasis on “socializing”, aka having success in the NT social world, which I have never achieved, and honestly never will. They got super concerned if I were hanging out alone (which was like a freaking red alarm to them). They often emphasized “socializing”; these simple words of a supposedly needed function for society would haunt me for years, because it was a constant ABA tactic my family would use against me. They found my computer “addiction” to be a problem, but in reality I had absolutely no idea how to function in the neurotypical world that I was being put through. It was a symptom of a much larger depression that was developing, and would affect me for years. It continued in high school. Yes, high school. ABA. For a high schooler. This predominately came in the form of speech classes; they didn’t help at all. Again, the content was that for learning in kindergarten, and again I was treated more like a robot than a human (I’ve learned that this tactic has been referred to as “drilling”). I was spoken to in a really soft, slow, dull voice. For the entire 9th grade I was put in classes with other SpED students, so basically I was segregated. I received this bull**** treatment of speech classes well up into the 11th grade, and they tried to put my there for senior year. I remember distinctly that there were disparaging comments made about autistic people by the teachers. Because I was never treated like a full human being, I never recovered a full sense of self-esteem. Because of that, I essentially stagnated. I’ve fought back and have found ways to help and develop myself. I’ve experienced a personal “cognitive revolution”, realizing all the lies that I was fed by the system. I’m still looking for a great area to share our own stories with each other, because there is such a genuine lack of support for autistic people who were left robbed and traumatized by these “therapies”. A lot of text, but I’ve spoken my piece. Just out of curiosity, how old were you at those points? Thank you for your insight! My three year old has autism and I felt distinctly uneasy about most therapies. I chose not to pursue them. I will add some observations here so it it easier to respond to all the comments is social media. Some have insisted on excuses, so I want to say this: abuse can come in many ways. I smiled a lot as I was being violently abused. I even tried to hug my abusers. Children can fake happiness and satisfaction, sometimes they don’t really understand how much their autonomy is being disrespected. Some might state the therapists good intentions. I do know some ABA therapists don’t really relate to the horrible things Lovaas proposed and did. But the fact remain that a group of people is seen as not good enough for the world – because of our neurology – and they need to be “worked on” to acquire skills that will make the neuromajority feel better. The usual line is “learn skills to make their lives easier in the world”. I am not saying parents and therapists don’t want to teach the children and make things easier for them. But the “easier” is an illusion because there is a price that we pay and it varies by degree, but we always pay. As I already said, every child needs to, or should, learn skills. Autism is a developmental disability and our brain is wired in a way that makes us learn not only in a different pace, but also in a different way. Why are we forced to follow a neurotypical timeline? Other comments pointed to how the children learn ABC’s and things like getting dressed, how there is only positive reinforcement. First, why ABA to learn things that a child might just take extra time to learn or maybe not learn at all, still being valued (I cannot get dressed by myself. I am respected for what I can do, not berated for what I cannot). Second, positive reinforcement can be bad because it is based on the perceptions of a neurotypical vision. Positive praise for what a neurotypical sees a “normal” or “desirable”. So, pay attention to how this can affect the children that you believe are doing “just fine, happy and content” right now. If there is even one thing that sends the most subtle message that something a child is or how a child does things is not the “right” way, this is a form of abuse. Back to my very simple example, with a different take: PECS is a very acceptable form of communication. Some people are great with it. But even suggesting that a user “uses their voice” is a form of abuse. Maybe not something that will hurt the child at the moment, maybe the child will even try but the damage to the self esteem is bigger than you think. It is positively enforcing that communication is good, at the same time that it tells the child “not the way you do it, though”. Behavior is communication and “fixing” behavior without letting us tell you, in our own term, what can “make it better”, is a violation of our autonomy, as uncomfortable that might seem to many people. One last point: most of the comments I read in social media of ABA therapist self praising, and of parents “very happy” with the ABA results (notice, the children “seem” happy, the parents “are” happy) are about skills that can be taught by a lot of other people that do not have degrees and do not charge a huge price for sessions. I cannot do much by myself, but most of what I can I learned from volunteers who really took an interest in me. Instead of asking for more money for ABA “intervention”, how about fighting for insurers to cover whatever the child needs, in their best interest? That would, hopefully, allow people who truly reject ABA to be completely free to use constructive, respectful methods and still, as many stated, be a tool to help the children with acceptance of who they are. Thank you for sharing your experiences. I do plain old disagree with a few things, though. You mention your reluctance to use PECS as a child and your preference for keyboards. But what happens when there is no keyboard available? PECS is easily transportable – keyboard devices have only recently become so and are expensive. Perhaps they were trying to teach PECS so that you always had a way to communicate, in case a keyboard wasn’t available? You mention that you cannot dress yourself. Completely understandable, and everyone has things they need help with. But, as a parent, I do not want to have to dressing my adult children. I just don’t. If we have to go through some training so that all of our rights are respected, then we will..
My issue really is that your argument is constructed around your right to say no, but you neglect to explore what that implies for the people around you. If you say no to getting dressed (in the case that you just don’t want to learn, I understand that perhaps you can’t), someone else is saying “yes”. And maybe they want to say no, too, but don’t. The bottom line is that we all have to learn/do things we don’t want to do. I hear your point about being made to feel less than, and that should never happen. But asking someone to change is not abuse by itself. We ALL (NT, ASD, everyone) have to change and some of that change is uncomfortable. The real questions, in my mind, are WHAT are we asking people to change, and HOW are supporting them. Those lenses have to be applied very critically, and many, many parents and therapists get that wrong. But, some do get it right. Letterboards serve the same purpose as keyboards and are simply a paper with letters that gets laminated. People don’t HAVE to change. Changing, as in growing, is a natural process. The thing is, ABA wants to change people to fit a predetermined set of “desirables”, the “everyone must to fit in this little box of things we (therapists, nuromajority) like”. I totally get that. I guess I’m saying that it’s not ABA, it’s the use/objectives of it. And I will always help my children with things that they cannot do. But sometimes there are things that they will not (not dressing in your case), and parents have to help all children see and know the difference and push themselves. And finally, the reason I felt compelled to post at all is that the feelings of parents do matter. Becoming a parent does not mean that you have to live the rest of your life solely for your children. Everything that you do does not have to be to make your children feel comfortable. In all actuality, at a certain point, children assume some responsibilities towards the parents’ emotional and physical well-being as well. Plus, parents are people first., and have the same rights to define personal boundaries as any other person. It’s a tricky and fluid process between parent and child, but as a parent I do get to say “no”, just because I am a person and we all do. And my saying “no” may mean that my child has to learn to do something that is hard. Again, I am speaking in generalities, and not to the specifics of your situation at all. You had a terrible experience with ABA, and I believe you. That experience by itself does not necessarily generalize to the entire set of people applying ABA, nor does it take into consideration changes by which ABA is employed today. It’ can be horrible, but it can also be applied in a very safe and loving and beneficial way. My children learned to speak, both more clearly and expand their spoken vocabulary, which then lead to them being able to communicate their needs more broadly, which then led to them being able to be more independent outside of the home. It also allowed them to start making friends more easily,, which my children wanted (I understand that not all children do, but mine did). So, I guess I will conclude with there are some clear guidelines that we all as parents have to follow to make sure our children are okay. Love first, respect for them as people next, then understanding who each of our children really and truly authentically is/wants and is capable of (this one is the hardest). Finally there is the duty to protect from harm. Using those guidelines, you will apply methods to support them appropriately. I do respect your safe place to share your thoughts, opinions, experiences, and perspectives, so I will bow out of the discussion. I value your voice and thank you for sharing!!! You don’t have to share, and yet you still do, which in turn helps so many people. It’s very much appreciated. Actually respect comes first but I’ll let it slide. ABA did not make your children speak. I can only hope your children find their own voices without trauma because I can make a very educated guess that the voice they have learnt is simply the voice they were told is desirable, accepted by the neurotypical majority. And you missed the point I made about my own experience with ABA. You had a terrible experience with a type of ABA, and for that I’m truly sorry. ABA did not teach my children how to speak, as I mentioned, it helped them to learn how to speak more clearly and use more words. And finally, thank you for your concerns for and support of the autistic community, my children included. They’re only 4, and we are all very happy and authentically ourselves. I hope that they always honor their authentic voices. Very best! you keep saying that I had a terrible experience with ABA. You are not reading what I wrote. 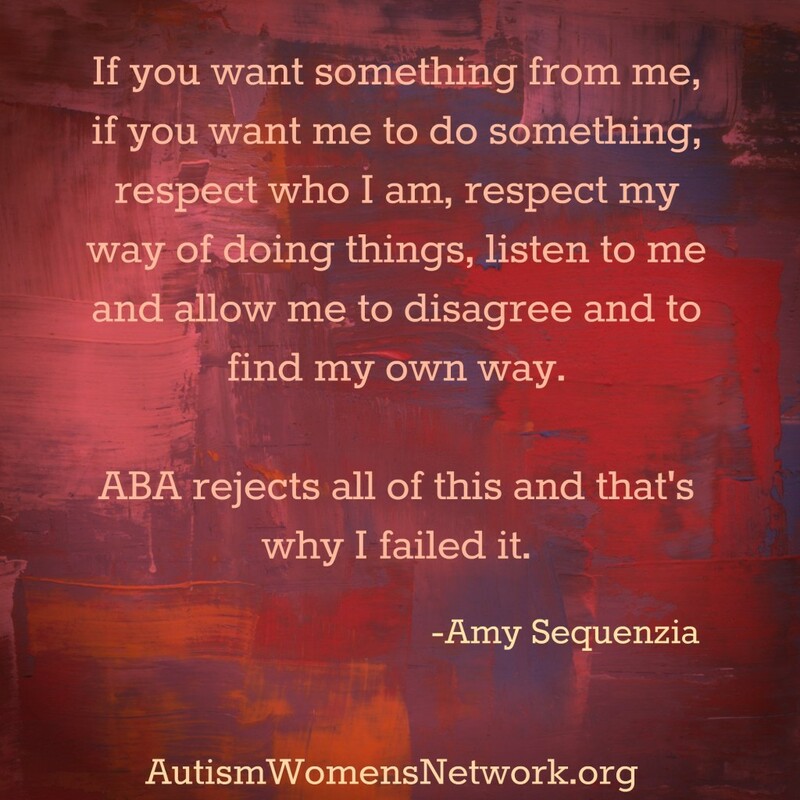 I am HAPPY I did not have a TERRIBLE experience because I was told I was too damaged to learn anything, that I FAILED ABA – and thus ABA proves to be a huge fail. Some people comply, some don’t, the ones who “learn” how to comply will see the consequences later in life. Di, your comment has been deleted due to violation of AWN’s commenting guidelines. You called some Autistic children brats. You based this opinion on your assumption that they make excuses for their behaviors. AWN is an Autistic safe space, and your comment violates our policy. Obviously, your ABA therapists were not good therapists. Many programs are extremely rote in the way they teach everyone and don’t treat people like individuals. Many of the therapists are poorly trained by people poorly trained. I worked for an agency that had AIDES supervising the TEACHERS. The Aides had little background and experience in ABA. They were taught to just follow the book which didn’t work. Shortly after I left that agency, The administrative staff was fired and the aides were returned to actual aide positions where they were supervised. Any therapist who things PECS is better than typing is incompetent. Also, a good professional understands that you can not base IQ on a standardized test. You need to observe the person and assess their general skill level. I worked with a boy who would probably score 0 on an IQ test, but when I gave him time to choose his activities and joined him, I could tell he had at least average intelligence. There are some people who call what they do ABA for insurance purposes. If they are actually doing ABA they are harming the Autistic person because ABA’s measure is how much the person will look like a non-autistic person, not how much the person is learning on their own time, at their own pace, the way it fits their abilities and needs. If our success is measured by non-autistic standards, this is not a “win” for us. ABA proponents might feel this way but it only means that the “successful” person learned to fake being someone else pretty well. My son is seven with ASD and has never had an ABA session thanks to advocates like you– and developmental experts like Robin Hauge. You pioneers are changing the landscape of how the NT world relates to Autism. We, us so-called NTs of the earth, are the ones who need INTERVENTION! Thank you for this insight into your world. I thank the good lord that I was not diagnosed as a child if that would have been my life. I have been misdiagnosed most of my life. Have been fed every horrid drug out there to treat my “phobias” . But I was given the freedom to find ways to succeed by being my own boss. I could work from home most of the time, only dealing with one or two people at a time, so as not to be on sensory overload. They called this agoraphobic. People learned that I needed to know in advance to get ready mentally for most anything and they worked with me because I was the boss. Before I was diagnosed I thought I was stupid because I had non-facial recognition and many other disabilities, but I never stopped trying to achieve my dreams. I truly believed that with hard work anyone could achieve. Just think what would have happened if someone would have put this label on me early, and everyone told me I could not do it, and instead tried to make me into a robot perfect person like normal people. Makes me want to cry for your pain and all those lost years. Thankfully I had the freedom to be me even if everyone thought I was weird. just wanted to say, I love the choice of words “…and that’s why I failed it”, not failed AT it. failed it. to me, this implies ABA didn’t reach your standard of decency at least as much as you didn’t reach it’s standard of faux-NT-ness. I took swimming lessons and failed so swimming lessons are all bad for all kids. We need to embrace the land lubbers in ourselves and reject the wet world. Nonsense- sure but it’s to make a point. You don’t dismiss the ONLY proven method to help people with ASD like my daughter. Don’t assume she will ever have the ability to write a blog or post a video about her views, in fact, you’ll have hard time finding any non-Asperger’s type ASD posting anything because they can’t communicate very well so we have higher functioning ASD types speaking for everyone else which is not clear picture of the situation. I was legally blind but I don’t pretend to speak for people who are totally blind. Around 25% of people drop out of school so education is a waste, right? No, not everyone can function in school environment but surely discouraging kids from at least graduate from high school is a bad thing. First, swimming does not require that you fake your identity. So your comparison does not hold. Functioning labels are a made up thing from neurotypical people, to grade us. It is not a diagnosis. But if you insist, I am still considered VERY LOW FUNCTIONING. I can type now but I am the same person I was before I could. ABA is also one method that caused many Autistics to have PTSD, so there you have it. I do hope you kid writes. Of course, ABA also teaches that children that they are not supposed to not like ABA, so it is a lose-lose situation for the kid. PTSD is ~100% guaranteed as an outcome of ABA. I don’t understand how ABA is being noted as responsible for causing PTSD? Am I missing something in these posts? The ABA program my grandson is in is a far cry from anything that could cause PTSD. He plays all day in a wonderful center that has an indoor playground, trampolines, books, toys. He learns valuable skills thru incidental teaching. I appreciate you putting your thoughts out there but this site is beyond just your thoughts when ABA is referred to as Abuse and is linked to PTSD. This site is not for me. Thank you. This is why ABA hates well being and commonly cause trauma. The science of ABA is coercive behaviour modification through environment reinforcements and aversives, regardless of internal experiences , feelings (eg anxiety and sensory). Internal drivers are outside the scope of its science. An ABA therapist is trained to not let a child avoid a situation as this would reinforce avoidance behaviour (regardless of how real a feeling of overload is to a child). It is invalidation of a persons internal experiences, feelings and right to say no or do things in a way that is natural or real to them that causes trauma. Having to do things in a way that is not true to their neurology and dismissing the child’s feelings as the child is presumed non-compliant without valid reasons. If this is not happening at your Grandson’s school then it is not ABA as studied, trained and Board Certified. My partner subjects me to de-facto ABA. She is from a culture that treats disabled people much more poorly than here in the US – in that culture if rich they never move away from the family compound and end up as adjuncts to “the help” – if poor they end up beggars typically dying as young adults. A few get “ABAed” (aka psychologically or even physically beaten) into submission, and if “little professors,” may find a vocation that allows “success.” If you read about the Tiger Moms you’d understand some of the cultural underpinnings. To her, there are two choices – choice A is that I allow her to ABA me into submission and choice B is going our own separate ways. Hmmm … tough decision. NOT! Pingback: Escritora e ativista autista escreve fala sobre inclusão em poesia | Espaço aberto para diferença e inclusão: que tal um debate sobre sociedade inclusiva? There are some behaviors my “high functioning” son (whatever that means…. )f has that are potentially dangerous. Such as, if he becomes very anxious suddenly, he will just start running in any directions, even into the street. We have been considering ABA for that reason, but I am very concerned about its effect on his psyche and self esteem.. We are relatively new to all of this, so I am asking guidance from you and anyone else who cares to share about what other methods are to gain compliance in the face of dangerous behaviors. I don’t want him to go through some kind of soul-sucking experience, but I also don’t want him to get hit by a car. Thank you so much in advance for any thoughts. Do ABA-therapists also intend to treat adults with autism or Asperger’s with ABA? In what way could that happen? So far I thought, ABA is limited to the (early) childhood of intellectually impaired children with autism. I can’t find any sense of that. Of course, there is not any sense of ABA at all as the damage is worse than the benefits, especially in the long-term. Amy, can you please provide the source on the survivor from Lovaas’ Feminine Boys project who later said ABA did not work? Thanks, Dave Jersey. I wholeheartedly agree with your definition of abuse, and understand that it is in direct relation to respect, or dis-respect even, that use of the term abuse is valid and true. People often seemed shocked when they realise coercion is abusive. But I believe that many educational methods are coercive, and therefore abusive. I’ve been introduced to ABA through a job I planned to apply for. On researching it I have found it to be exactly what I want to stay away from when working with people. I am not a parent, but someone who has spent a long time working with people with disabilities. I believe in respect and collaboration, rather than coercion. I feel a main issue is that our world does not adhere to facilitating for the people who are less able to adapt into common place routine. I feel more work needs to be done in society to respect those who are different to the majority, rather than making those who are less able to conform fit into a prescribed state that is not appropriate for the individual. I also feel that a better way to be with those who are different to you is to try and imagine how you would feel in that person’s shoes. Would you want to be forced into behaving as the ‘normal’ person does, or would you find it easier to communicate once the person had taken time to gain understanding of your experience of reality? Pingback: Let’s Talk about the Autism “Puzzle Piece” | Celebration Generation: Food, Life, Kitties! I wonder your thoughts on children with autism who engage in extreme behaviors such as self-injury, and aggression towards others? I don’t disagree with your opinion, but am curious how you apply it to people with autism who do engage in such extremes. I do hope that all people with autism have some method of communication inside them, whether or not they have found it yet. But then there are the cases when the child’s reaction to being told no, for example, is to become aggressive or to slam their head into a wall. I’m not suggesting ABA, but is it really realistic to wait until the child “finds their own way?” when their well-being or the well-being of others is at stake? What then? I dont think anyone is saying let a child who is distressed and can not communicate find their own way. A child can be supported with communication, anxiety, sensory, motor issues in ways that are respectful of their neurology and not ABA. Amy points to a FB page above that could help more. There is so much on social media nowadays about why such behaviour occur and what can be done about it in a way that is respectful, kind and humane. If a child acts aggressive after being told no, they are trying to communicate and need a form of communication. Usually pthey are communicating fear, anxiety, overload, fright, frustration (say for not having been helped to be given a firm of communication that makes sense for them.). To consider that many think they are just bring subhuman non-compliant individuals is heartbreaking. Ok so, little late to this but as an autistic person (who is constantly told that because of how functioning I can appear to be and because I can manage to hide most of my meltdowns until I am in private thanks to being bullied in school for 13 years straight k-12) who is a caregiver of another autistic person with a lot of autistic friends and a friend who has a child who is autistic and is helping that friend work with their child to understand how their child communicates, I am going to speak up on some things. Aforementioned friend? Low income and they have a “professional” come in for “ABA” therapy. Billed as such so insurance will cover but in no way resembles ABA and it’s abusive techniques. More like a tutor type person who comes in 2-3 hours a day 5 days a week and works with one or both parents as well as the child to help all be on the same page. They have a letter board that the child (I say child because I don’t like gendering people based on genitalia as I am genderfluid and hated being gendered based on mine and still do despite repeated coming outs but child is gendered male) can point to letters and spell name and can point to yes and no. Child is non verbal and they accept that and have obviously worked a way around that so they can communicate. They are also learning ASL with the child. The tutor is fluent in it as well. Which is why the 5 days a week. So, when they’re out or child doesn’t want to get letter board they can still communicate especially if it’s something like hunger, thirst, or bathroom. I was VERY wary when friends initially told me they were enrolling child in ABA. But when they explained it privately and had me meet the tutor and they showed lesson plans and intent I stopped worrying especially with the at least one parent must be in attendance at all times with tutor. Their child is still non verbal, has their own style of play, is encouraged to play how they want to play, and communicates with their parents for basic needs, and overall everyone seems happy. They work with the child and what the child can and wants to do. The only thing that they do stimming wise is take the violent ones towards others and work on making them into less violent towards others and obviously try not to overstimulate their child. The person I am a caregiver for can’t dress themselves if it’s more than pulling a tshirt on and basketball shorts and socks on. And shoes occasionally. I have to help him shave his face. And dress when he needs to wear nicer things (which, in itself is a nightmare in a half given that he also has ODD and whoo buddy if I hadn’t lived most of my life with him I would have rage quit already). Although he can bake and stuff, he’s not allowed to on his own or unsupervised. Due to incidents of almost burning house down before. He can luckily take a shower on his own and bring dishes from his room to the kitchen. The rest though, is what I get to do for him. And once he’s asleep or hasn’t woken up is when I get my meltdowns. ABA may have a bad name but I feel i have to mention, that is an old school view. ABA is in-fact a child centred approach and interventions are individualised to suit the child. ABA practices are based on scientific evidence and the interventions monitored throughout and up dated when required. Although people may have had real horrible experiences, is it ABA or the person delivering the ABA that is to blame. I am currently studying MSc in ABA after receiving a BSc Hons in behaviour analysis and intervention. I believe most of the negative issues surrounding ABA are primarily from some therapists who do not deliver programmes or interventions correctly or with any empathy. The aim of ABA is providing coping mechanisms and skills for daily life this also includes the promotion of personality, independent skills, confidence etc; I happen to believe laughing and having fun is a great way to learn for a child. I am working with children with special educational needs including ASD condition for 15 years and have always had great relationships with each child i had the pleasure to support. I always encourage laughter and fun! my methods including ABA have always been successful and i am yet to meet a child I have not been unable to connect with and support. It is not an old school view. For the job I am taking I’m required to register as a “behavioral technician” and take the required courses to get my job. This is implemented for the entire state of Nevada and it is riddled with incredibly poor and abusive tactics. Lots of forced compliance and “stimming extinction’ due to the stimming causing “social issues” which don’t effect the autistic person at all. Can ABA be “fixed”? I’m not sure, I don’t think it would truly be ABA anymore if the abusive tactics were removed. Would that be a preferable solution? Absolutely. There are many things that, if ABA professionals would come together with autistic people to really discuss and evaluate, could actually put things in the right direction. Maybe it’s a terminology issue. What my children experienced was termed ABA, but had none of the abusive components outlined in this thread. Very child centric, and I was encouraged to observe, which I did. I had to fire one therapist because I thought that she really didn’t like children and that was showing in her work. Otherwise, there were typical ABA components like rewards for extending attending skills, etc, but their stims were never used as rewards and “quiet hands” was a term that I never heard employed. I think it all comes down to the parents. You know your children. Never let anyone do anything that goes against your gut, as long as said guy is filled with love and acceptance of your child. I understand what you’re saying as many companies must claim they’re ABA to be able to bill insurance for self help therapies, however, the reality is that this is what ABA is. Even if I never use these abusive tactics (and I won’t) that doesn’t change that this is what ABA is defined and taught as. Many of my colleagues will utilize and hold these tactics as “good” or “beneficial” for autistic people. This is the definition of ABA. So, while some people call themselves “ABA” in order to be more accessible and help autistic people, the core and reality is that this is what people in colleges and those just looking to register statewide are being told is right and acceptable. A lot of parents are worried and scared for their children and what will happen when they get older so a “professional” coming to them saying “They may be upset now but this will be better for them later.” may seem like it truly is to them. Especially if they are at the “end of their rope” because they don’t know how to correct a problem behavior or how to teach a skill. I am glad that your children had a positive experience with something called ABA, that organization and peoples know what is appropriate in teaching skills to autistic children. But the fact is that that isn’t what the core of ABA is, which is the entire issue at hand. “Real” ABA is abusive and, even “nice” but “real” ABA has many abusive tactics, it needs to be addressed and fixed before it stops leading to the frequent abuse of autistic individuals. Yes. Amy. ABA is Abuse. ABA is described as such a good thing for problematic behaviors but it is mostly used on Autistics. There is a huge push in research now to diagnose Autism younger and younger in infancy or even the fetus if possible so the child gets ABA therapies as soon as possible. This tells you that despite the claims by ABA supporters that we do not want to make Autistics less autistic or not Autistic that is exactly the ultimate goal. Our brain wiring is largely formed in the infant and toddler years. The goal of ABA is to intercept or deflect the natural development of a person before he or she becomes autistic. On all these claims about good ABA, the most evil ABA is looked down upon today because the Autistics you criticize spoke up. That ABA has a monopoly on the treatment of American Autistic children is a big problem. Like any monopoly, it discourages research on less expensive and time-consuming treatments making claims by ABA supporters that it is the only “evidenced based” treatment a self-fulfilling prophecy. It often gives parents a choice of accepting the ABA or pay out of pocket, disrupt their change-resistant autistic child’s life and move a long distance and take a chance the alternative treatment is not a quack treatment. If the family does not have the resources to move and pay for alternative treatment, the choice is often between accept ABA or have the parents do it all themselves. I am turning 60 this year and was undiagnosed until a few years ago. There was plenty of difficulties with being undiagnosed all that time but if I had a choice between my life and being an autistic child today enrolled with 25 to 40 hours of ABA I choose the life I have had without question. That is a very sad and bitter thing to write. Thank you, ever so much, for writing this post. It’s so full of everything I want others to know about ABA. Fine way of describing, and good piece of writing to take information about my presentation subject matter, which i am going to deliver in school. Honestly I’m surprised nobody seems to have discussed how dehumanizing it is for ABA “subjects,” I guess you could say, to be rewarded with a cookie or some other “treat” for complying with ABA therapists’ commands. It immediately reminds me of canine obedience training every time someone talks about it (at which point I promptly want to hurl). Also, boy, do I feel lucky I was diagnosed too late in life (first at age 10 then again at age 13) to have to go through this BS. If I had, I bet my mom would have insisted on putting me through it regardless of whether or not it would have done me any good—and having always been one to question authority when my needs are being ignored somehow, I probably would have failed in a mattter of months. In fact, I did have a first grade teacher who tended to use physical restraint a lot to keep her students in line, and I ended up fighting back just about every time. Last I heard, she no longer works at that school.